If you are a complete beginner at baking your own bread then you’ve landed on the right page! Here we talk through the process step by step, whilst giving you baking hints and tips to help you produce perfect bread. Baking bread is quite simple, but you will need a few bits and pieces to get you started. Tip: Baking is a science so it needs precision and accuracy. Do not be tempted to guess weights and never switch between metric and imperial measurements. With so much choice on the market, it can be hard to know which flours to choose. 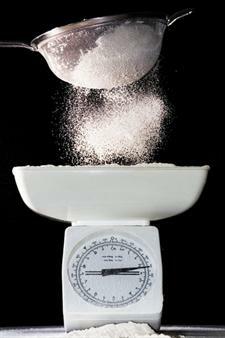 The type of flour that you use can alter the taste and characteristics of the bread that you make. We’ve highlighted some of the options available to you and the characteristics that your loaf will have if you choose to use them. For breadmaking with yeast you need to choose strong or breadmaking flour. 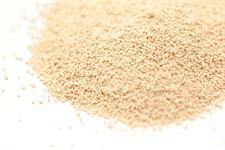 Wholemeal flour – If you use this type of flour, you will produce a wholemeal loaf. The bread will be more dense than a standard white loaf. Tip: If you want the health benefits of wholemeal, but you want a lighter loaf then you can mix wholemeal flour with white flour. Adding fat in the form of butter or oil will also help to produce a softer bread. White flour – White flour will produce a lighter and more airy loaf than if you use wholemeal flour. Flour with added grains or seeds – This type of flour can help to add texture to the bread and will often give the bread a lovely nutty flavour. Bread mixes – can help to liven up your breads because they often contain added ingredients such as seeds or mixed grains. They make bread making even easier because generally you only need to add water to them. As the ingredients have been pre-measured exactly, they normally make good quality loafs. You may see the words ‘flour treatment agent’ on the list of ingredients in your flour. This improver is generally vitamin C (ascorbic acid) that makes the dough more manageable and gives a helping hand to get your dough to give a well risen loaf with what’s known as a ‘good volume’. Flour was once bleached using various bleaching agents. Use of bleaching agents declined steadily throughout the 1980s, until it ceased to be available altogether under the 1995 Bread and Flour Regulations. So now absolutely no flour in the UK is bleached. Tip: Although you can use plain flour to make bread, you will get a much better result if you use strong flour, because it contains a higher gluten content, which helps to give the bread its springy texture. Fresh Yeast – is available from baker’s shops, most supermarket in-store bakery departments and health foods shops. It is pale beige in colour, has a sweet, beer like smell and should crumble easily. It can be stored in the fridge wrapped in cling film for up to 1 week or can be frozen for up to 1 month. Fresh yeast is not suitable for breadmakers. Dried Yeast – is simply the dehydrated equivalent of fresh yeast but it needs to be blended with lukewarm liquid before use. Store dried yeast in a cool dry place and check the ‘use-by’ date on the tin or packet – the yeast won’t work if it is out of date. Easy Blend and Fast Action Dried Yeast – this is the most convenient of the dried yeasts as it can be added directly into the flour. Fast action yeasts and some easy-blend varieties contain a bread improver, which eliminates the need for two kneading and risings -check the instructions on the packet to make sure. Yeast Dough by the Sponge Method – the yeast is dissolved in warmer water than usual, and then mixed with some of the flour to make a batter. This can be done in a bowl, or the batter can be made in a well in the centre of the flour, with only some surrounding flour included at the start. The batter is left for at least 20 minutes – often much longer – until bubbles appear on the surface, a process known as sponging. It is then mixed with the remaining flour, and any other ingredients are added. Sourdough – a traditional sourdough starter is made with flour and water paste that is left to ferment by wild, airborne yeast. Some yeast is added to encourage the fermentation process. Once established, sourdough starter can be kept indefinitely in the fridge. The longer a starter is kept, the better the flavour. Tip: Yeast will not perform at its best if the water used in the dough recipe is too hot or too cold. The ideal temperature for the water is tepid. This involves working the dough in order to stretch the gluten contained within it. It also helps to distribute the yeast, enabling the dough to rise evenly. 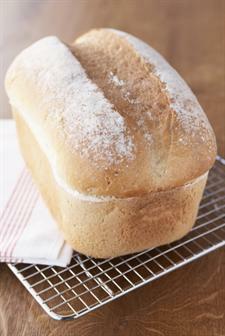 Tip: White bread will take longer to knead than brown or spelt bread. You can either knead the dough by hand or use a food processor with a dough hook. 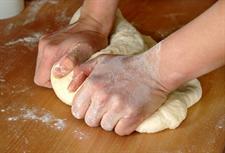 Kneading by hand: Place the dough on a lightly floured surface. Press the heel of your hand on top and push it away from you then fold the dough back on itself. Then turn it around and repeat the process. Most dough will need kneading for about 10 minutes. To see if it is ready, press a finger into it, it should spring back instantly. Kneading in a mixer: Put the dough into the mixing bowl and using the dough hook attachment, mix for about 5 minutes. Be careful as you can over mix in a machine and the dough will be unusable. It is ready when it wraps itself around the hook. Dough needs to be left to prove or rise. This happens when the yeasts begins to ferment and releases carbon dioxide which stretches the gluten in the dough. It should be left somewhere warm to double in size, usually for about 1 hour. It should always be covered with a damp, clean tea towel or clingfilm so that it doesn’t dry out. Don’t make the mistake of leaving the dough somewhere too hot or for too long or the yeast will be killed off and the bread won’t rise. To test if it’s ready, give it a poke with your finger and if an indentation remains the dough is fully risen. Knocking back -This is a term used for giving the dough a second knead. It is done to knock the air out of the dough and it helps to distribute the yeast. You only need to do this for a couple of minutes, and some recipes do not need it at all. Bread requires a hot oven so it is important to pre-heat the oven before baking. Most bread is baked at gas mark 6/200C (190C in a fan oven) but all recipes vary. The bread will continue to rise for about the first 10 minutes of baking, after this the yeast will die. Bake until the top is evenly golden. To check with the bread is ready, tap the bottom of the loaf, if it sounds hollow it is cooked. If not put it back in the oven, out of the tin and bake for a further few minutes. Once the bread is done, leave it to cool in the tin before removing it. Always slice bread using a serrated knife to avoid damaging the crumb structure. Once the bread has cooled, wrap it in foil or place it in a plastic bag. Bread that has a crisp crust, will soften on storage, so until it is sliced it is best left uncovered. Once cut, put the loaf in a large paper bag, but try to use it soon, as it will dry out very quickly. Bread made with honey or added fats such as butter will stay moist for longer. Ideally, freshly baked bread should be consumed within 2 – 3 days. Avoid storing bread in the fridge as it will go stale quicker. You can freeze bread if you need to keep it for longer. Place the bread/rolls in a freezer bag, seal them and freeze for up to three months. If you intend to use the bread for toast or sandwiches, it is easier to slice it before freezing, so you can remove the number of slices required. Thaw the bread at room temperature, still in its freezer bag. You can even freeze dough once it has been kneaded – put in a plastic bag, seal and freeze for up to 1 month. Thaw overnight in the fridge then continue with the recipe.